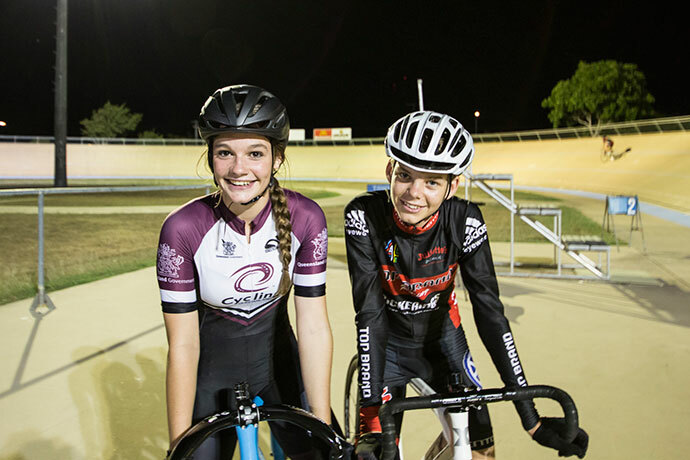 At 15 years old, Chloe Brewer loves the speed, balance and determination that are all part of track cycling. 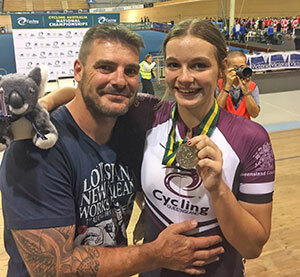 And she’s clearly got a knack for it – already racing in the women’s grade locally; the William Ross State High School student took out a silver medal at the 2015 Cycling Australia Junior Track National Championships in February competing against girls a couple of years older. We caught up with her to find out what’s next on the cards, how she’s balancing training and schoolwork, and what she loves about hanging out at the Velodrome. What do you enjoy about track cycling? I like going fast! We travel at about 35-40km/h in training, but I have no idea for racing as we’re not allowed to use a speedo. I really enjoy the social aspect of training and racing at the Velodrome – I’m pretty much friends with everyone at the track: I’m a social butterfly (laughs). 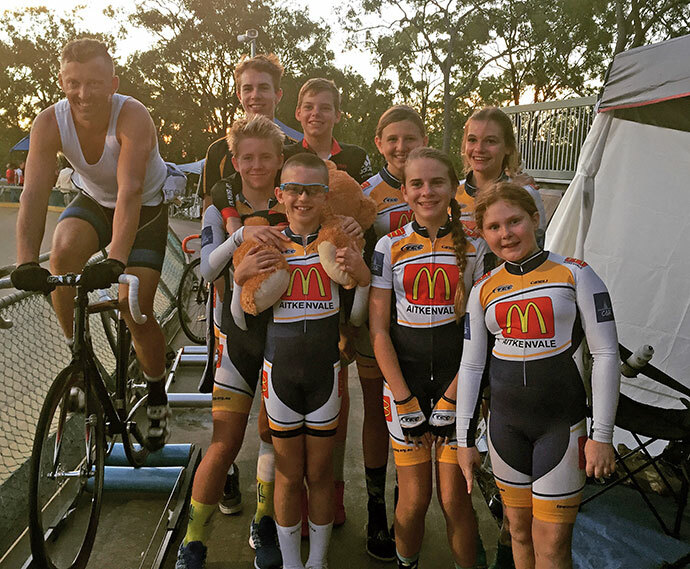 Want to give Track Cycling a go? 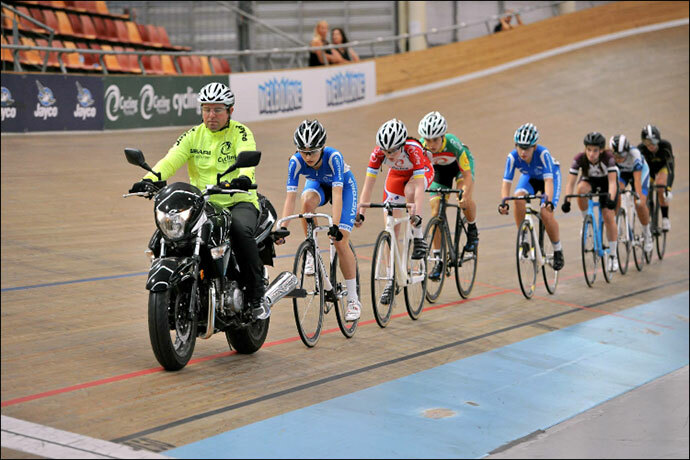 The Townsville Cycle Club is running FREE Intro to Track sessions as part of the Women in Cycling Series. How long have you been track cycling and how did you discover it? Dad’s workmates actually suggested it because it’s a safe cycling environment – that was three years ago now. Chloe at Tuesday night training with brother Jared (middle) and friend Ethan Viviers (left). Track bikes don’t have brakes or gears – were you freaked out by that at the start? No, not at all – I just eased into it by riding around the bottom of the Velodrome, which is called the duckboard. I was riding on the track within the first session. What was the biggest tip you learnt in those early days that helped you? Don’t overlap wheels. 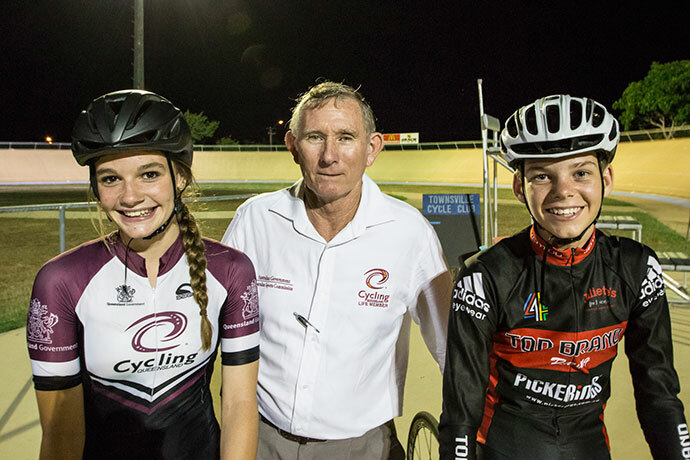 In Rockhampton where Chloe got second place in the Capricornia Cup on Wheels in January. Had you done cycling in any other forms before? Before I started track I’d done BMX for two years. That was in Darwin where we used to live – my dad is in the Army and we get posted to different states. I enjoyed the fast pace of that too and raced competitively. I was fourth in the state in my age group before we moved. What skills in particular do you think you need to be a good track cyclist? Determination, balance and strength. I think I’ve always had determination and competitiveness to beat who I’m training with; now I’m working on my strength and endurance. 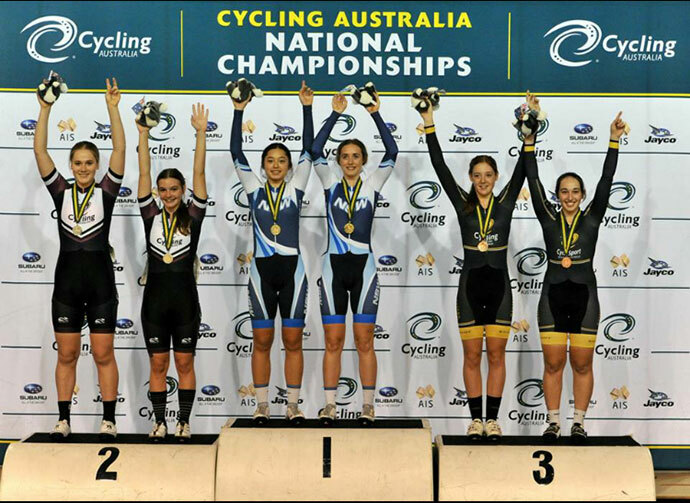 Chloe celebrating her silver in the team sprint with partner Lara Tucker at the Nationals in Melbourne. 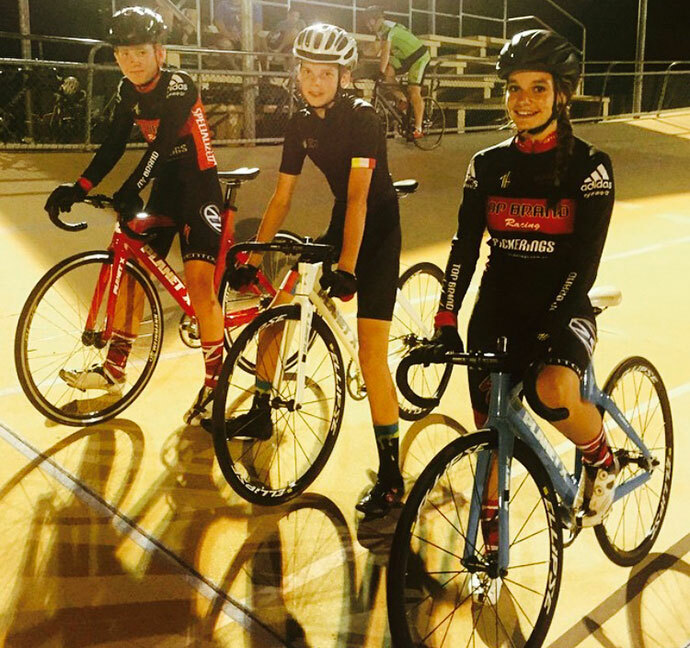 How did it feel to recently win silver in the Under 17 Girls Team Sprint at the Junior Track Cycling Championships? I was ecstatic – I couldn’t believe it. After showing the medal off around the track back in Townsville, I hung it up on my wall in my room. I’ve also taken heaps of selfies with it! Can you describe the experience and how you felt leading up to it? 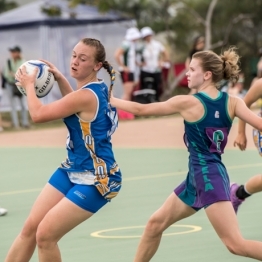 I had competed in the state titles before, so had an idea of what to expect, but I still got butterflies in the lead-up to the nationals every time I thought about it. I raced against older girls (U17s), so that can be a bit intimidating sometimes. What other achievements are you proud of? Just how far I’ve come really. What’s your next big goal? 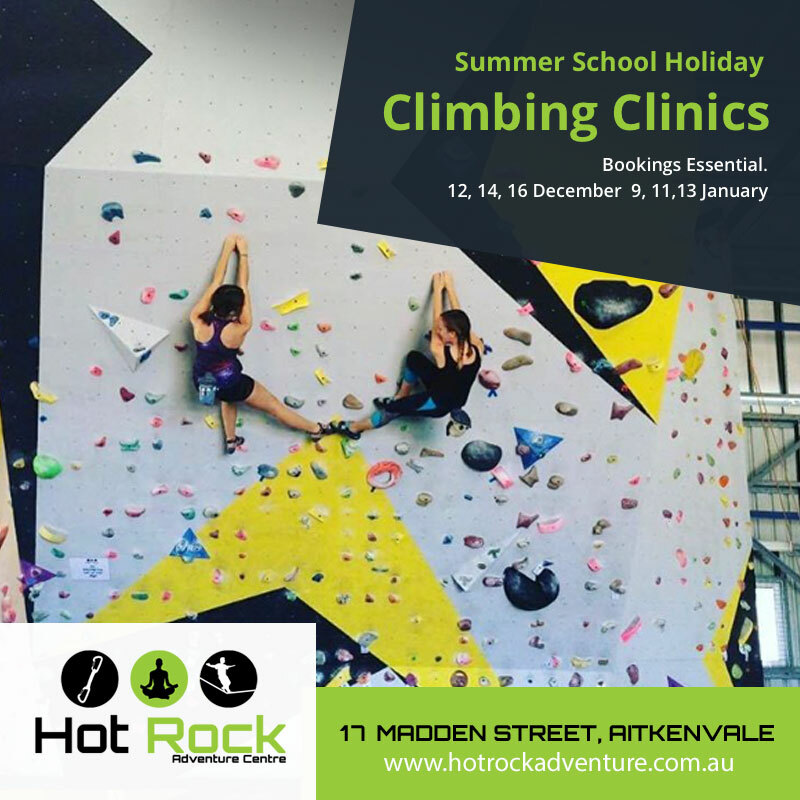 Performing well at the Townsville Cup on Wheels [October], and an eight-day carnival in Tasmania at the end of the year [the Tasmanian Christmas Sports Carnival]. What training are you doing to get there? 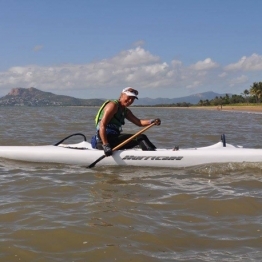 Endurance training on the road, which involves long distance rides – about 40km at around 30km/h. I really enjoy the social aspect of road riding. Chloe has loved her time on the track since she started three years ago. What role has your coach played in your success? Dannie Ormonde has been fantastic and is always there to help me. He is able to pick my weaknesses and modifies my training to help me overcome them. He always tells me, “Weight on them pedals”. How much does your brother train with you? Do you think he’s proud of you? Jared (14) does all the same training. He told me he was proud of me at states and when I came back from nationals and he gave me a big hug. Chloe with coach Dannie Ormonde and brother Jared, who she trains with. Are there any women you look up to in cycling? Anna Meares [world champion and Olympic gold medallist Australian track cyclist] – I admire her general attitude and the way she represents herself and her country. What’s the best advice you’ve received so far? “It’s not about winning it’s about 100% effort”. Your top tip for other cyclists? Train hard and race easy. 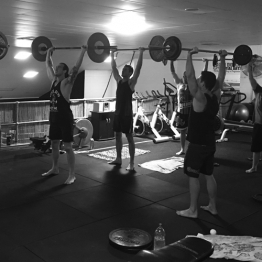 What training do you do each week? Two to three track sessions and as much road as I can wake up for. 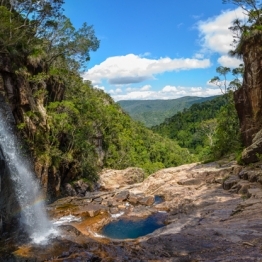 What are your favourite things to do on the weekend in Townsville? 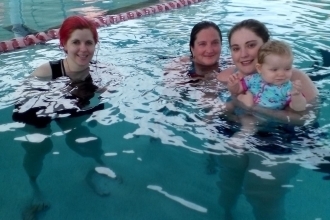 Swimming and training. 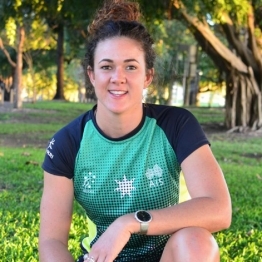 I swim at North Shore pool with [coach] Dylan Viviers – it’s for fun and to build my cardio fitness at this stage; not something I’m planning to do competitively. 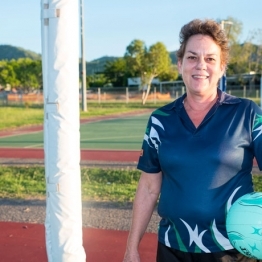 How do you balance school and sport? It’s always homework comes before training. Would you encourage other girls your age to get into bikes? Yes: It’s great for fitness, balance and it’s very social. Last words? Just the biggest THANKYOU to my coach for everything. Also thanks to my mum and dad (Briony and James Brewer) and the support I’ve received from Jake and the staff at Top Brand Cycles – my sponsor – with bike maintenance and high fives. 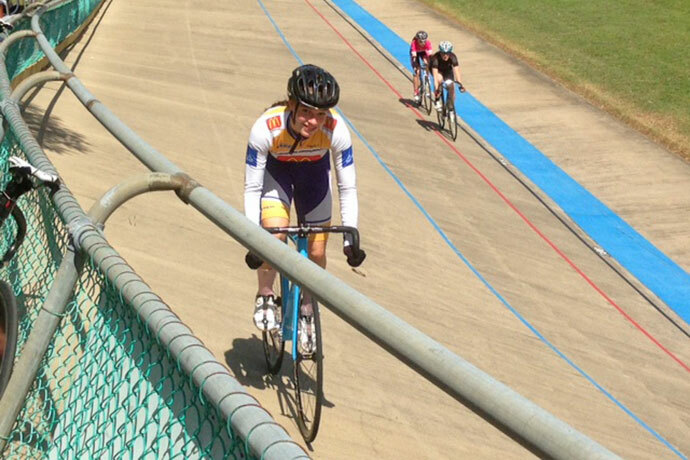 If you’d like to give track cycling a go in a no-pressure and fun environment, the Townsville Cycle Club is running FREE Intro to Track sessions as part of the Women in Cycling Series. Bikes are supplied. There’s a session on Wednesday, April 15 and another on Wednesday, April 22. 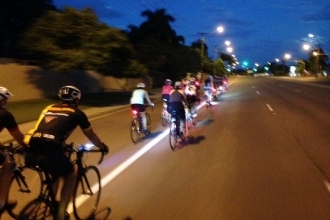 For more information and to book see here: https://thegotownsville.com.au/women-in-cycling-series-2015/.